The Dalhousie Tigers football club finally gave their home fans something to cheer about. 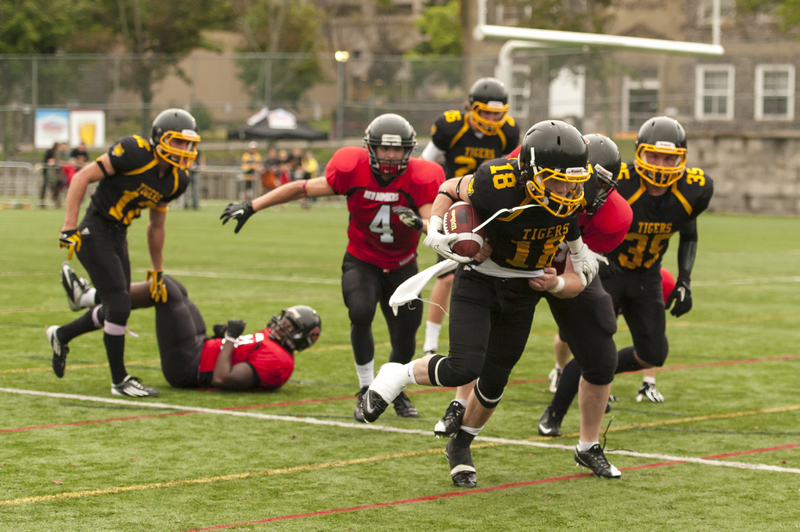 Opening the season against the University of New Brunswick Fredericton Red Bombers, the Tigers capitalized on a strong third quarter to win 25-6. Buoyed by excellent defensive pressure and overwhelming special teams play, the Tigers contained the defending Atlantic Football League (AFL) champions and secured their first home win since 2011. An early interception by the Tigers led to a field goal attempt, but the kick was wide to the left. The Tigers did score shortly after, pressuring the UNB-Fredericton punter into conceding a safety to open the scoring at 2-0. The score remained the same until late in the second quarter, where the Red Bomberspicked apart the Dal secondary on a long drive capped off with a diving touchdown pass with 0:55 left on the clock to go up 6-2. It was at this point where MacLean decided to send former Holland College quarterback Nick Hunsley in to replace Mike Tassone. The switch quickly paid off, as Hunsley led a late drive that came up just short, but momentum carried over into the second half. After pinning the Red Bombers inside their own 20, the Tigers recovered a fumble after a botched handoff. Hunsley later scored on a QB sneak on third and goal to put the Tigers up 9-6. The Tigers defence came up big on the following drive, stopping UNB Fredericton on a 3rd and 2. Once again, defence led to immediate offence with running back Will Brien scoring behind excellent blocking. The Tigers, firmly in control, would add another touchdown in the fourth quarter. Rookie quarterback Matt Shannon, who relieved Hunsley earlier in the quarter, connected with wide receiver Luke Williams for the score. Later, in a play that epitomized the Red Bombers’ struggles, a missed snap on a punt attempt would go through the punter’s legs and out of the end zone resulting in the second safety of the game and bringing the score to 25-6. The Tigers head out on the road for their next game, facing off against UNB-Saint John on Saturday, September 22nd, hoping to continue their winning ways.